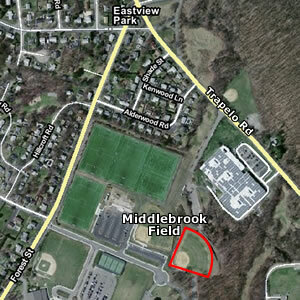 All of our games are held at the "Veterans Memorial Athletic Complex", located at 371 Forest Street, Waltham, MA. 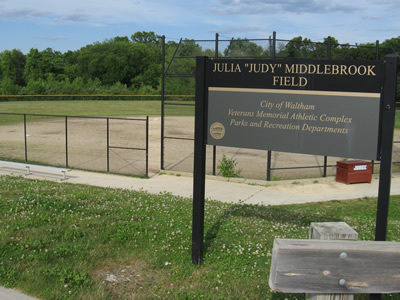 (Google Maps) The fields that we use are named “Robert Cusick Field” and "Julia 'Judy' Middlebrook Field". 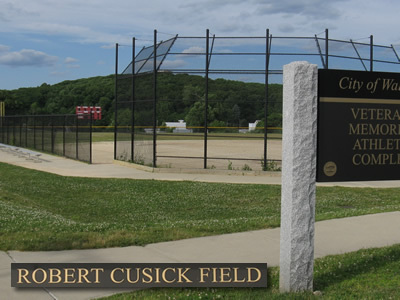 Cusick Field is the field you first see when entering the parking lot, while Middlebrook is just below a hill behind the right field fence of Cusick. (It will appear hidden while in the parking lot.) Refer to the marked satellite image below for the exact location of each field. Take I-95 to exit 28A - Trapelo Road OR take Wyman St. to Trapelo Road. Following Trapelo through two sets of traffic lights.